The Ceremony is such an important part of your wedding and so time should be put aside to plan it just how you want it. There are a few options you have to organising you Ceremony. I can organise for you a Registrar from Madeira to conduct your Ceremony. It will be legally binding and Internationally recognised and when you return home you can register your wedding certificate in your home country. To legally marry here in Madeira there is quite a bit of paperwork to organise, which I can assist you with. Click HERE to find out more about the paperwork that is needed. Portuguese Ceremonies tend to be very formal and don’t have as much romance that you may be used to, as the ceremony consists of the Registrar reading through all the paperwork, including your names, addresses and even sometimes your dates of birth. Within this ceremony, there is not much scope to personalise it. 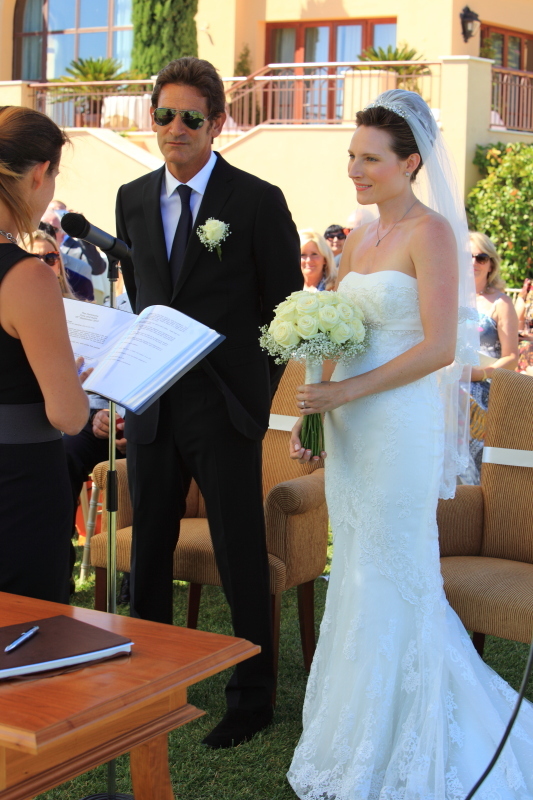 Symbolic Ceremonies are conducted by a Celebrant and they are not legally binding. They are however a very popular option for foreign couples coming to Madeira as there are no restrictions on words and so the ceremony can be designed to follow more of the traditions that you would recognise, including the Giving Away, exchange of rings, personal Vows and any Readings. There are also lots of extra elements which you can build in, such as Sand Ceremonies, Wine Ceremonies and so many more. Click HERE for more information on Unity Ideas. As a qualified Celebrant I am able to write and conduct a ceremony for you. How I work is that I find out a little about the two of you and any ideas you already have and then design an initial draft ceremony. I then email this to you and we send it back and forth tweaking it until it is perfect. We can even build in a certificate signing. Couples choosing a Symbolic Ceremony either organise the legal side of their marriage in their home country before or after the wedding here in Madeira, or they organise the legal side here, signing the final paperwork with the Registrar the day before their wedding or even after their ceremony while the guests are having drinks. I can assist with organising the paperwork if you chose to do it here. Symbolic Ceremonies are also used for Renewal of Vows as they don’t require any legal paperwork. The third option is to combine the two. I could design you are Symbolic Ceremony that follows all the traditions that you would like and within the ceremony we build in a legal signing. After the Vows are said, The Registrar would then stand in and conduct the legal side and you would sign all the documents (much like signing a wedding certificate with witnesses). The Registrar then steps aside and I conduct the final close and get to say “You can now kiss your Bride”. Personally, when couples want the legal element conducted here in Madeira, I feel the nicest flow for the ceremony is when the couple complete the legal side with the Registrar after the main ceremony when their guests are having drinks. The decision is yours. I am happy to discuss all the options in more depth with you to ensure you make the best decision for you. Copyright © 2019 Madeira Weddings. Powered by WordPress. Theme: Ample by ThemeGrill.